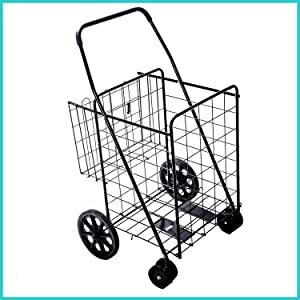 Sturdy steel construction offers ease in transporting loads up to 200 lbs. Double front wheel assemblies allow the tightest turns with the heaviest cargo. Products that will enhance your quality of life. Our products are meant for everyone. The folding cart does exactly what it should. It folds quickly and conveniently. It hardly takes up any room at all. Put it in the closet, or put it in the trunk of your car. When opened it is strong and firm and won't collapse when you are using it. We have been so please to learn how it has become "a must have" for so many people. Around the store, around the town. This will be your "go to" for getting the groceries. Very easy to maneuver the extra large and firm handle makes getting up the stair very simple. The added basket is great for putting you things close to you. 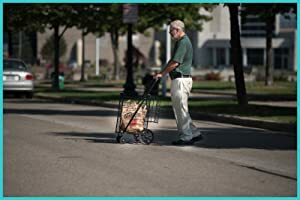 Bags will not fall out and you will be secure knowing that the Deluxe folding cart is always ready to go when you are. Simplify your life! The Deluxe folding cart just makes your life easier.